It was a wonderful week of break from all the things called normal life. I was so happy to share some of my friends with you last week through guest posts and I’m equally as happy to be back with you today! I missed you lovelies something awful. 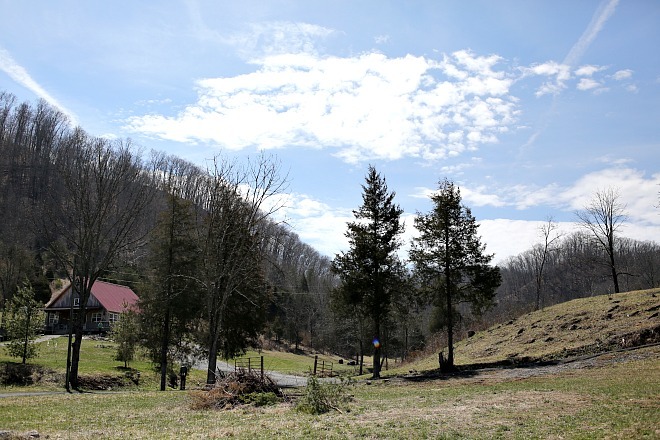 We spent the week in the mountains working on our little mountain cabin, getting it ready for good people like you to come and spend the weekend with me! As soon as we finish it, I’ll be making plans for our first retreat so stay tuned. We built the cabin ten years ago and haven’t done any updating since then. I decided that since my own house is chocked so full of color and pretty things, I’d let this place be a retreat from all my normal tendencies. So, we’re going modern, spartan, rustic on a background of white. 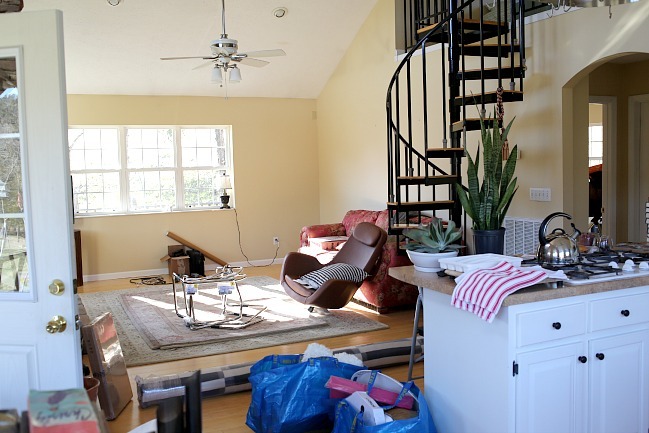 Here are a few pictures from before we started, with yellowish/khaki walls and stacks of things from my trip to IKEA. 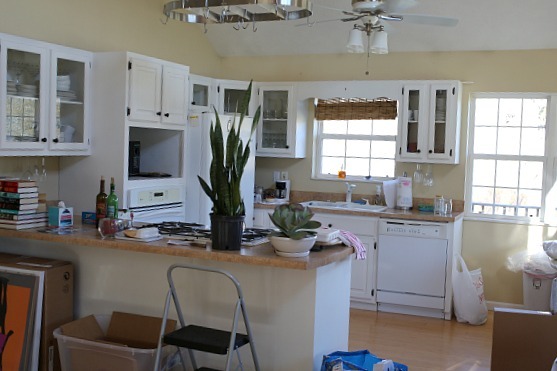 It’s basically a large front room that contains the kitchen and living area, with two small back bedrooms, a central bathroom and then a loft with another bathroom. It’s hard to get motivated in this little slice of heaven because all you wanna do is a lot of porch sitting and big talking. The cool mountain mornings make you think you’re in Narnia. Everybody that was willing to work was handed a paint brush and an IKEA chair to assemble. We got so much done, which may have something to do with having no phone service and the slowest most countrified internet in the world. I tried to send an email at 8 in the morning and it finally went through at noon. This is horse and buggy internet but probably good for when you’re trying to retreat. The 7th graders and the college graduates and the tired mommas alike got busy on the transformation. We all pitched in and put things together and painted like there was no tomorrow. It didn’t take long in the painting process for the magic to start happening. I bought the wrong size for the sofa cover, but now I’m waffling and wondering if I might just get the white one instead of the orange patterned one I had my heart set on. Y’all. I’m not gonna lie. Every last thing in this little mountain home looks better dressed in white. 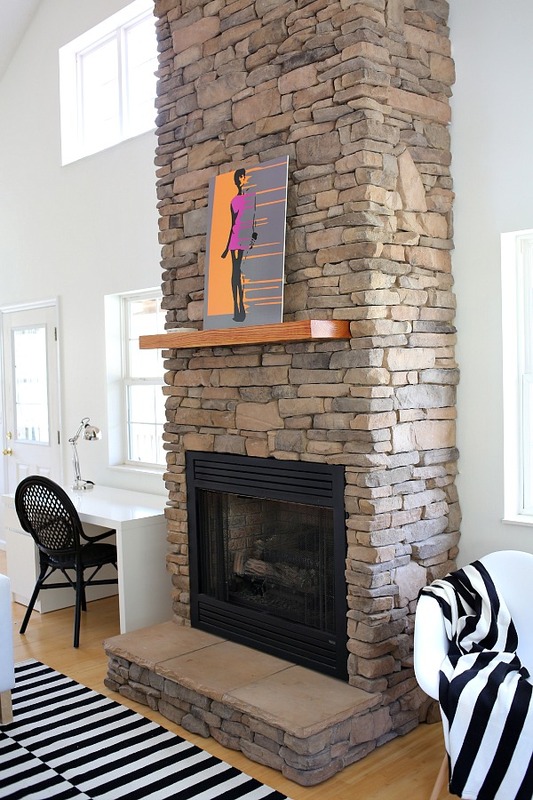 The stacked stone fire place stands taller and the light bamboo floors walk softer. The spiral staircase even seems to cause less vertigo. If I’d have known this, I would have painted it white from the beginning. Well. I took a Facebook poll that was split right down the middle between Simply White and White Dove. So, I did what all lovers do and I threw myself with abandon into perfect peace and compromise. It’s equal parts of both. My next question is? 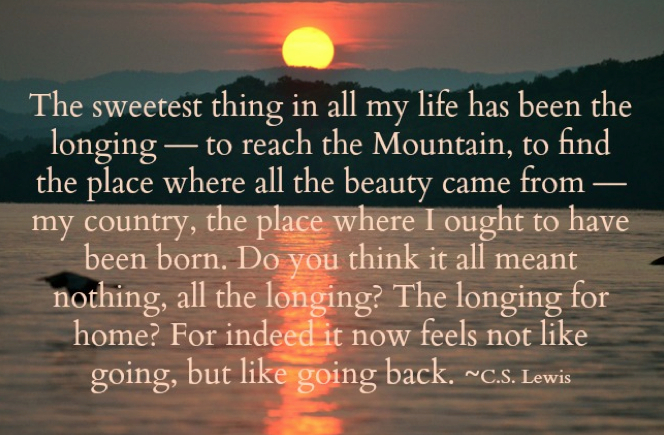 Would you come to the mountains with me so we can talk about Lewis (and his quote that causes the hairs on my arms to raise up)? So we can ponder the place where all the beauty comes from? Also, I’m painting the outside of the cottage and you can visit here to see what color I’m contemplating. LOVE Y’ALL and so happy to be back! Love.It.All! 🙂 Truly. So happy you had a work week with family and accomplished much. It looks absolutely lovely. So happy for y’all. And, yes, would LOVE to come to a retreat there any.time. Oh it looks fabulous .. The white truly makes the fireplace look even more stunning than it ready is..
Congrats & I wish you lots of happy weekends there .. THank you so much Ms. Lesley!! We just built a house and it is all white! I’m fighting a big battle in my head between a lot of neutral decorating and a lot of colorful decorating. I love your leather lounge chair though, where is it from?? It’s from IKEA. Almost everything is! It’s lovely and I love the quote at the beginning. One of my VERY favorites, Michelle. It’s from his book Till We Have Faces. So pretty! 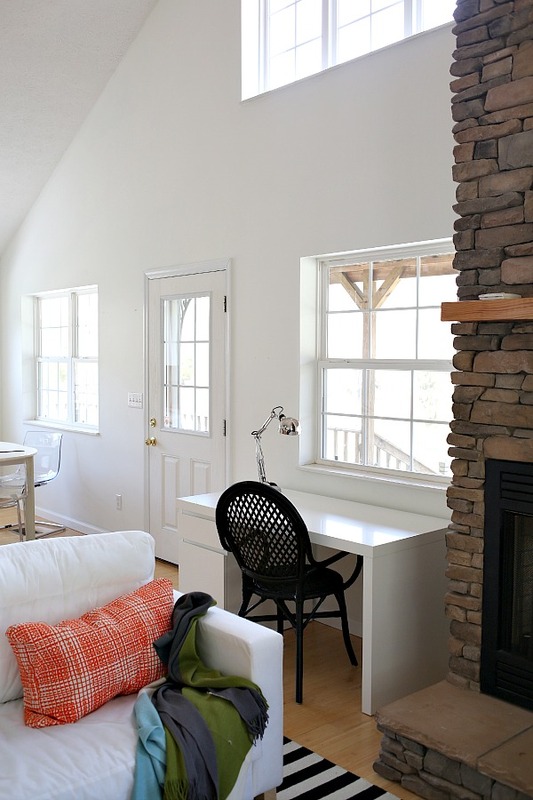 We’re getting close to painting our mountain cabin in Simply White, so it is fun to see your white. I do love the way it turned out. It looks different in every room and at every different time of day. It’s gorgeous! Love the stripes in rug and throw, too! I know, it almost makes me wanna make nice with IKEA. Love the walls painted white,,,and for the couch/sofa,,I like white, maybe it’s an Elvis thing,,or that white is peaceful, or so the beauty from God’s gracious colors can speak from outside. I’ve never done it before, June, but I do love it! How lovely that you have in mind sharing your slice of heaven! If you host it, I will come! And I love all of your choices. I love color too, but it’s fun having a second place to take in a different direction! Well done! Okay, I’ll hold you to that, Leslie!! o, edie! it is absolutely serene! what a blessing to be able to get away at such a little slice of heaven! I’m just giddy over it too! Love it! And keep the white couch it is fabulous! I know, I’m loving it too Katie! So peaceful! I read the Lewis quote several times…wow, just wow. He often has articulated thoughts that I have had, but do not know how to write myself. Thank you for sharing! All the white looks wonderful & peaceful.. The fireplace pops! I love being at the lake…I spend lots of time with God on our pier..can’t wait to get back after the winter we have had …we painted our cottage in Northern Wisconsin a deep chocolate brown with cranberry trim 2 years ago and wow do I love it! I might have considered the black if I’d seen it …. Looks beautiful …. i love the tobias chairs. we have two at our breakfast table right now and i think i am ready to go ahead and get 3 more. they do scratch, but i just love how airy they are! your cabin is amazing. Just Gorgeous!! You ladies are a-maz-ing!! I would even fly out from California to retreat with y’all. Great work Edie! Looks amazing. As far as the exterior is concerned…I am obsessed with dark house with white trim…that would be my vote!!!! Welcome back! First of all, I would like to thank you for the wonderful guest bloggers that posted while you were away. The quote is perfect and speaks to my hearts desire. I love the mountains and dream of having a cabin or condo there someday. Our daughter is a student at Appilachian State University in Boone, NC so I get there pretty often. I would absolutely love to come for a visit! You all have done a beautiful job renovating! You all did such a great job, I love it! Thanks for sharing. Looks like a great place to relax and unwind. girl. it’s a bold woman who can live in the world of color AND live in the world of white. i’m so proud of you sister. and my goodness….i. am. in. love. simple as that! I hope I make it to one of those retreats! You have such a talent for creating beauty! It is absolutely stunning! As for a retreat at your slice of Heaven, I think that is a wonderful idea and I would definitely be interested. We just drove through Tennessee this past week (stayed in Franklin one night) and my husband and I always comment about how lovely it is. We sometimes talk of moving there after our kids are grown. The white sofa—will show every speck of everything. If you can live with speckles, go for it. Yes, yes & YES!!! It would be a dream to meet up and just chat it up in the mountains with you! Thanks to Paige, I’ve been following you girls for about 4 years in the blog world…if it’s possible to have mentors via the interwebs I would count you two as two of mine! Love the cabin…you’re an incredibly talented decorator, even if that isn’t what you went to school to do! I love the 2nd pin on the first row, if you go left to right, and I also love the 1st pin on the 2nd row. Can’t wait to see what you choose! I’m not one for lots of white, but I have to admit it does look charming in that cabin. 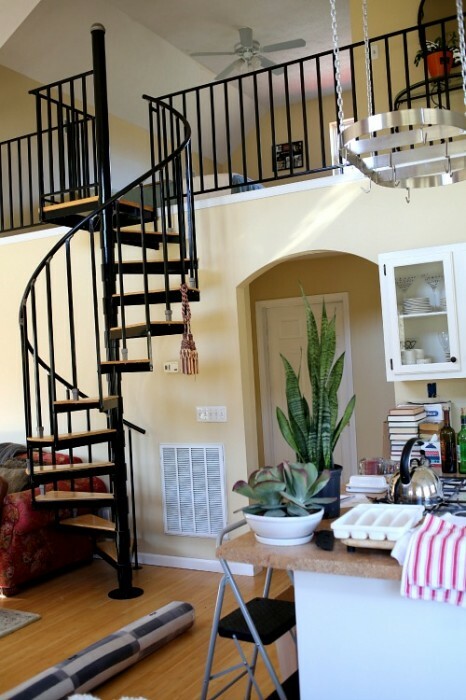 I do love the spiral staircase and that fireplace! The colors you’re contemplating for the outside are beautiful, too. happy retreating! 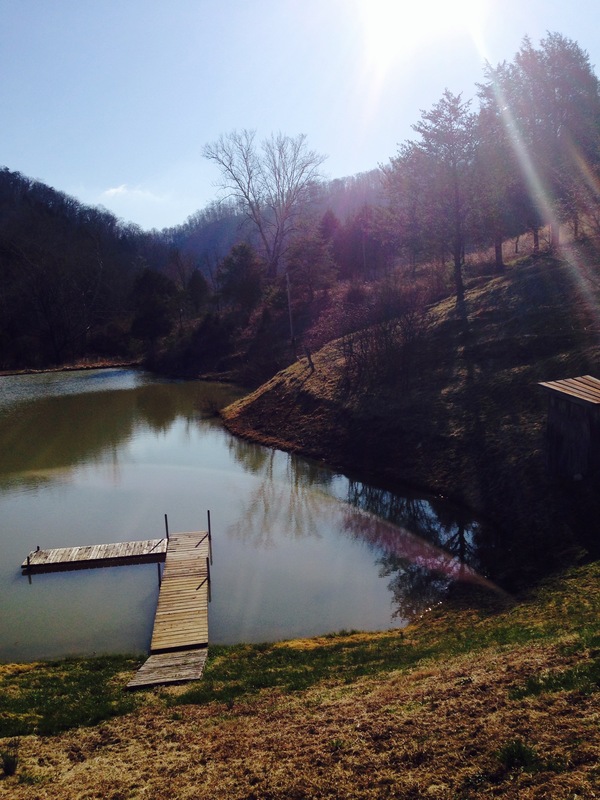 I love your beautiful white cabin surrounded by God’s glorious creation. Amazing, peaceful serenity. Absolutely reminds you of Narnia. A retreat with you, in those glorious mountains, discussing Lewis and so much more, is a definite to do. 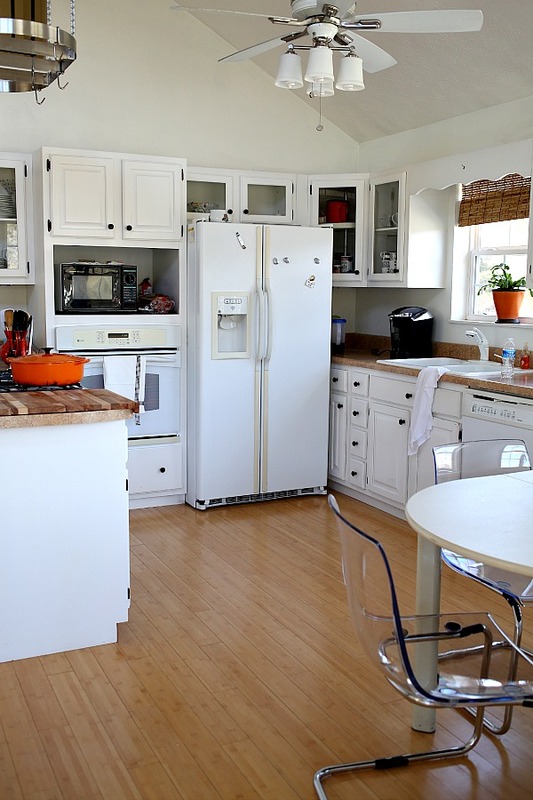 Love the white walls and cabinets. for the couch cover I might go for something darker as we are dog people and the dog is spoiled rotten. however, go for it if that is your vision. I love it all!!!! What a restful place and it totally made me think of Paige so I laughed when I got to the end and saw that you referenced her. Love it! I LOVE the cabin and the setting. 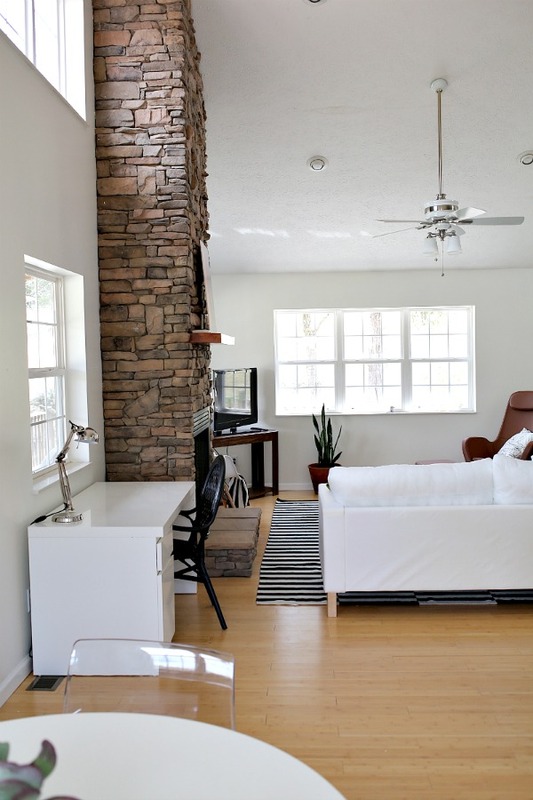 I think the white makes the fireplace pop – also, it let’s you have a very clear, uncluttered space for contemplation. 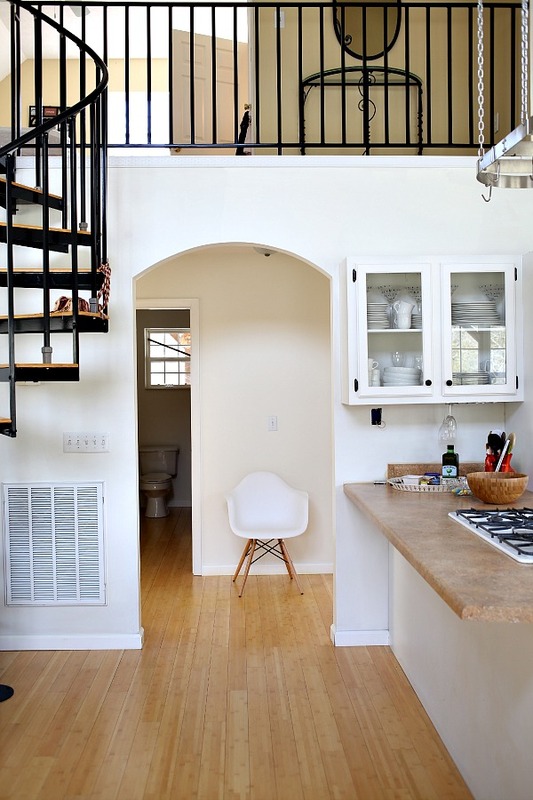 I love color normally, but am leaning more toward white with minimal decorating for that very purpose. I would love to just come and sit on the porch. My heart years for mountains. The quote is one of my favs! Everything looks fresh and wonderful! I am really partial to that mid tone gray house with the awesome gold door! Loving the white and the fireplace looks wonderful next to it! 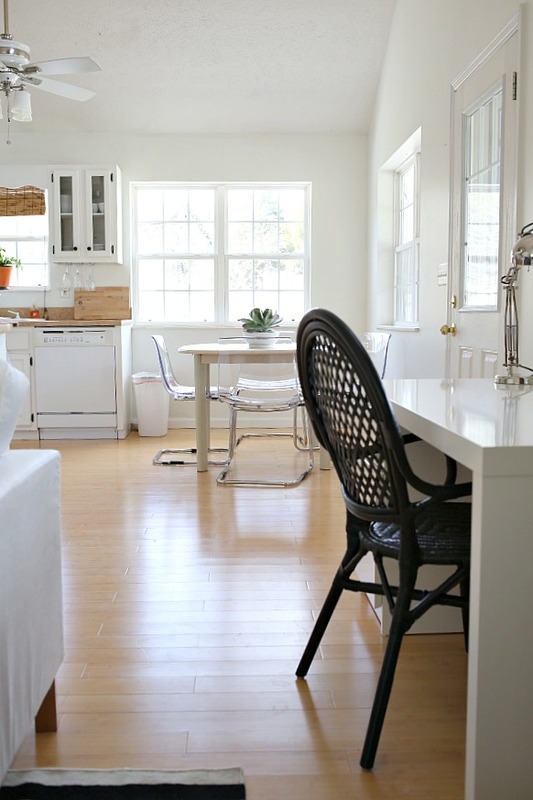 My own house is colourful but I do dream of an all white room someday! A black n white exterior will be gorgeous! I would love going to a retreat with you!! Love the white. I love the white… I also love the old yellow and would be so happy if you shared the name?? 🙂 I need a nice yellow. Beautiful! If you invite us all, we might all bring a bottle of wine with us. the white walls. oh the white walls. and….you should TOTALLY go dark on the exterior. tell me when and i’m there. I miss the mointains of TN. Kind of made me sad to see them; ot’s been so long. Your cabin retreat will be a blessing to you adn many others. Love the patan look. Nothing to distract you from the mountains, thinking and big talking. A retreat with my virtual best friend!? That would just be amazing! I could knit my heart out in that cabin! Is the cottage exterior all wood? If so, have you considered using a stain instead of paint? Lower maintenance in the long run. And it will look good even when it ages.